Sleeping during the day and working at night was his regular routine. He had no discipline in life and ate indiscreetly. He weighed 79 kg at a height of 5 ft 6 inches. He tried to lose weight by just dreaming about it and doing the bare minimum. He did not have a good workout routine so the small gym that he had created for himself at home was not utilized to its optimum. Finally, magic happened and he got into a routine. He joined a gym with a personal trainer, his diet got regularized and he is far healthier and fit that he was. It all began for me in August 2017 when I took a trip to McLeodganj for a couple of days and had rich grand meals. When I came back home, I weighed close to 79 Kg at the height of 5 Feet 6 inches. I was aware that I was leading an unhealthy life but I wasn’t doing anything about it. Set up a small gym at home but hardly worked out. My routine was haywire with me sleeping during the day and working at night. My eating habits were bad and nothing was helping me get on track. I wanted to change things for myself. This is when I was introduced to GOQii by a friend. I liked the concept of a personal coach who will motivate and push you to achieve your health goals. 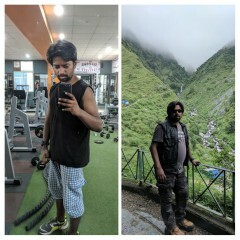 I enrolled in GOQii and also joined the Gym with a personal trainer. This started my journey of transformation! On my first day at the Gym, I felt nauseous and thought I’d pass out in 15 minutes. Other guys were working out smoothly which was quite intimidating. There were so many well-built guys using heavy weights that I could not even dream of. The key, I realized, is patience. Rome wasn’t built in a day. Don’t compete with others, compete with yourself to achieve your goals. Apart from a gym workout, cardio workout is important for me. Most of the fat which I had, was on my belly. I started by walking for 2 km, increasing gradually to 5 km per day, at the speed of 5 to 6 kmph. Then, a bit of my belly fat melted, I started running/jogging at 8kmph. I gradually moved to 10 kmph but reduced the distance to cover (to 1.5 km). Currently, I work out for 30 minutes mostly focusing on the abdominal area. Slowly once the belly fat saw some reduction, I started working on 2 muscles a day. One thing which is very important to keep in mind while undertaking any health goal is that it takes time to achieve these goals. You need understand your body and how it reacts to various strenuous exercises. You need to have patience especially when it comes to achieving weight loss goals. 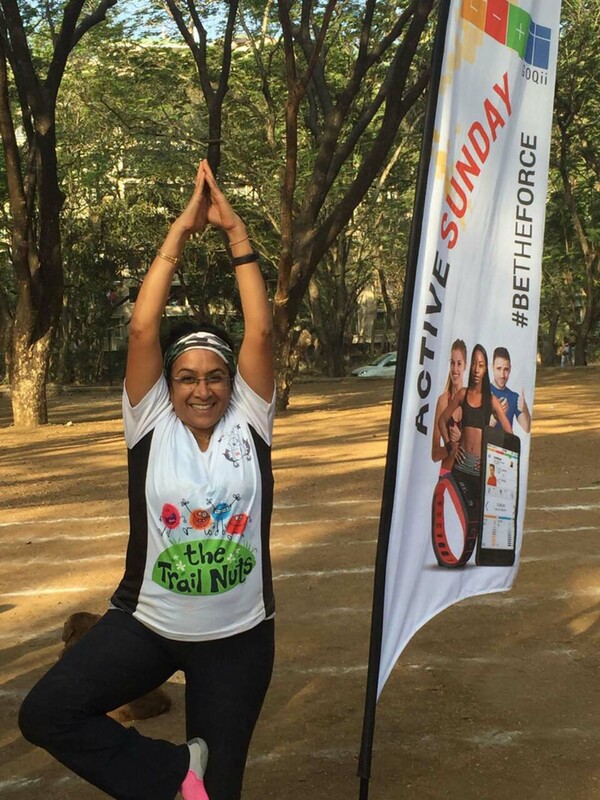 My GOQii Coach helped me make healthy food choices. My diet now includes pre and post work out meals and salads. I was never a salads guy but I eat them now. I have stopped having refined sugar since November 2017. My meals are balanced and portion size is small with multiple meals in a day, unlike my earlier three large meals. All these small changes over time have helped me achieve my health goals. I am much fitter and healthier now. My only message to all is don’t be disheartened if your hard work does not pay initially. It takes time. You won’t see changes in a week. Just be self-motivated and keep pushing yourself. There will be days when you won’t be able to work out or you won’t be able to follow your diet. But, it’s okay! Continue with the same routine next day. When you fall, you must have the willpower to stand up again not once but multiple times. 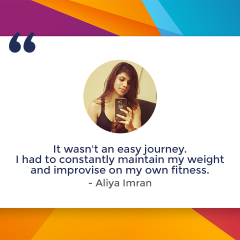 Its sheer determination and hard work that will help you achieve your goals. Did I fail during my transformation phase? Of course, I did fail, and on more than one occasion but I never gave up. What does coach Evangelene Wankhar have to say about her player Ashwin? Ashwin Chitransh was assigned to me in October 2017. 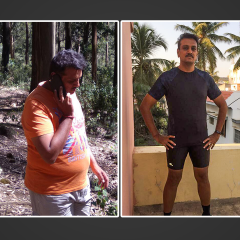 His goal was to lose 10-12kgs. He wanted to get active and build strength. Prior to GOQii, he had already started with gym workouts with a personal trainer and lost 3kgs. But, his concern was his food habits. When we started, he was having a heavy meal for dinner, adding few unhealthy foodstuff during the day. These were old habits which I had to gradually get him to shed. Each time he had a heavy meal and ate unhealthy food, I guided and explained to him the pros and cons. I told him choosing healthy food over unhealthy will help him achieve his goal. He agreed and started applying the tips I shared with him every day. Of course, he had few cheat meals but he has managed to make the cheat meals healthy as well. If he took something over the counter which was unhealthy, he compensated that with more activities and a healthy diet the next day. Over the last few months, he has progressed well. He has been very consistent in his workouts, healthy food habits and has been following every guideline that I share with him. I am proud to say that Ashwin has achieved his target goal of losing 12kgs and now we are in the process of building his strength and muscles since that is his next goal.